With the fall auction season off to a fairly shaky start with the Impressionist & Modern Art sales last week that set a few records but had a very-high rate of buy-ins, this auction should prove to be a real bell-weather of the strength of the markets in the face of a less than booming stock market and the continued uncertainty over the Presidential election. The sale has many important works from the Lannan Foundation and very good examples of the more famous Post-War artists. Highlights include major works by Mark Rothko (1903-1970), Arshile Gorky (1904-1948), Francis Bacon (1909-1992), Kenneth Noland (b. 1924), Morris Louis (1812-1962), Alexander Calder (1898-1976), Joan Mitchell (1926-1992), Isamu Noguchi (1904-1988), Philip Guston (1913-1980), Frank Stella (b. 1936), Brice Marden (b. 1938), Anselm Kiefer (b. 1945), Jasper Johns (b. 1930), Donald Judd (1928-1994) and Andy Warhol (1928-1987). Many of the auctioneers this season have attributed the spotty performance so far this season to "competitive pressures" and high estimates, presumably generated by consignors high expectations based on strong prices over the past two seasons. Furthermore, they have argued, the marketplace is increasingly sophisticated and focused primarily on the finest pieces and not merely pleasant, "decorative" examples of an artists work. Nonetheless, the auction houses have traditionally in recent years kept their estimates low and most of the more prominent buy-ins recently have had relatively reasonable estimates. A high percentage of buy-ins usually indicates a collapsing market, but some of the new records have been so robust as to indicate that money is still very much available. Perhaps part of the explanation of the markets vagaries may be attributed to the general collapse of the dot.com sector of the financial markets that may have curbed the enthusiasm of some "new" buyers. While the Impressionist and Modern Art auctions this season did not have a slew of masterworks to offer, the Contemporary and Post-War auctions are flush with very fine works. Based on the fall catalogues, it does not appear that the continuing legal problems of Sothebys and Christies have deterred too many consignors, nor resulted in a rush to Phillips, which continues its major campaign, launched last Spring, to become a serious challenger to Sothebys and Christies in New York. This was a strong and successful sale in which 13 auction records were set for individual artists. The sale realized $43,140,900. The pre-sale low estimate was $40,695,000 and the high pre-sale estimate was $56,575,000. The star of this auction is Lot 31, "No. 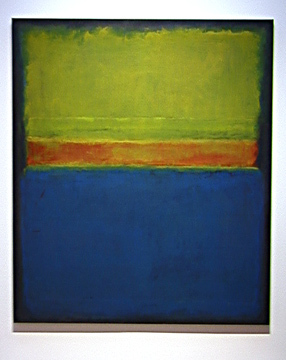 2 (Blue, Red and Green," an 81-by-67 1/8-inch oil on canvas, shown at the top of this article, by Mark Rothko that was executed in 1953 and has an estimate of $8,000,000 to $10,000. It sold for $11,005,750 including the buyer's premium as do all prices in this article. . As in No. 2 (Blue, Red and Green), Rothkos bright colors, and the chromatic contrasts that merge yellow and blue into green, are sufficiently dissonant as to be disquieting and otherworldly." This is a fine, totemic work of great solemnity and sobriety by Rothko. Lot 32, "Khorkom," a 40-by-52-inch oil on canvas by Arshile Gorky is a dramatic contrast with the Rothko. This is no amorphous, infinite or indefinite space, but a bold and precise space. This museum-quality work, painted circa 1938, resonates with luminosity and Gorkys surrealistic forms. It was at one time in the collection of the Museum of Modern Art and has a quite conservative estimate of $1,500,000 to $2,500,000. It sold for $2,205,750. .In Khorkom and the Garden of Sochi series of the early 1940s, a related series of images predominates. Influenced by Joan Miro, Gorky integrates figure and ground, expressing his sense of fantasy in abstracted forms that exist as a cosmos amid a vast expanse. 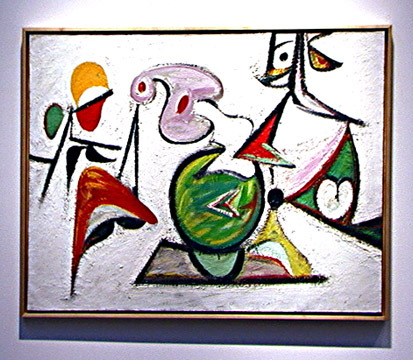 Unlike Miro, Gorkys shapes remain relatively flat without modeling and spatial illusionism. In Khorkom, the moon-shaped yellow, soft gray and pink palette, the red and green wedges that anchor the swirling green center, the black eye in profile  all are suspended in a thickly painted and flat white space, linked by an alternatingly looping or insistent black line which threads from form to form." Gorkys biomorphic forms would find resonance in the later work of Francis Bacon, whose disturbing portrait distortions morph his subjects into often weird and terrifying transformations. Lot 43, "Study for a Portrait of Clive Barker, two 14-by-12-inch oils on canvas, is a good example of Bacons morphic style. Bacon, of course, has a much more painterly style and a softer palette than Gorky, but his works are equally bold and fascinating. This lot, executed in 1978, has an estimate of $800,000 to $1,200,000. It failed to sell. 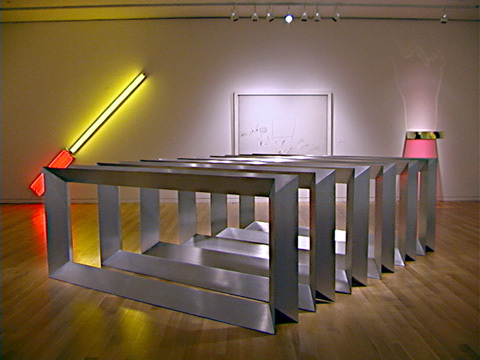 Barker was a sculptor friend of Bacon and in 1978 exhibited twelve studies of Bacon in a London show that included three studies of Barker by Bacon. The catalogue notes that Bacon boldly confronts his subjects and that Barker here is "presently almost filmically, in two fleeting moments," adding that "He appears to fidget across the canvases, each subtle movement intensified by Bacons exceptional motion of his loaded brush." It adds that "this terse, deeply-felt combat is counterbalanced by the softness of Bacons palette." This auction has a very impressive selection of works from the collection of J. Patrick Lannan, a Chicago and New York industrialist who for a while was president of the Modern Poetry Association and developed a close relationship with noted art critic Clement Greenberg. Lot 16, "Heat," is a intense ring of colored circles by Kenneth Noland, a 63-by-65 acrylic on canvas, which was executed in 1858 and has an estimate of $250,000 to $350,000. It sold for $797,750. It is one of several works consigned by the Lannan Foundation. 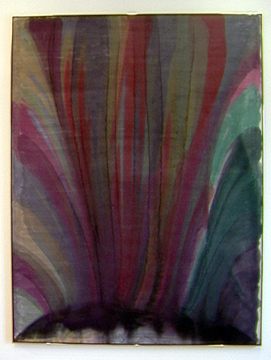 Perhaps the most spectacular work consigned by the foundation is Lot 18, "Atomic Crest," by Morris Louis, a 105 ½-by-78-inch acrylic resin on canvas, dated 54. It has a conservative estimate of $300,000 to $400,000 and unlike many of his works in which poured paint occupies only a portion of the canvas this painting is fully covered in a fan pattern with a very soft and lovely palette. It sold for $335,750. Lot 19, "The Snowflake Tree," is a very delicate and fine mobile by Alexander Calder (18981976), that measures 96 by 106 by 52 inches. The painted steel and wire mobile with an electric motor was also consigned by the foundation and has an estimate of $800,000 to $1,200,000. It passed at $650,000. Lot 20, "Monongehla" is a very vibrant 1955 oil on canvas, 72 by 78 inches, by Joan Mitchell (1926-1992) that has been consigned by the foundation and has an estimate of $400,000 to $600,000. It sold for $830,750, breaking the previous world auction record for the artist of $552,500. Lots 21, 22 and 23 are three interesting sculptures by Noguchi that also have been consigned by the foundation. They carry estimates of $350,000 to $450,000, $600,000 to $800,000 and $400,000 to $600,000 respectively. They sold, respectively, for $390,750, $643,750 and $489,750. Lot 22 broke the previous world auction record for Noguchi of $632,500. Another Lannan consignment is Lot 24, "Nunca Pasa Nada," a large striped work by Frank Stella (b. 1936) that measures 110 by 220 ½ inches and is metallic powder in polymer emulsion on canvas. The 1964 work has an estimate of $1,000,000 to $1,500,000. It sold for $1,435,750. The catalogue notes that and six other of his paintings in this series alter "the shape of the canvas, and reiterates that lengthened, zigzagged shape with the use of pencil-thin lines throughout." "The spontaneity of Nunca Pasa Nada belies its awesome power and almost overwhelming scale: it is as vulnerable, clipped and seemingly precarious as it is monumental, definite and finite. Ever ambiguous, even at its most explicit, Stellas art renders spectacular the crisis of easel painting in the twentieth century," it added. Yet another Lannan painting is Lot 25, "For Pearl," a 96-by-98 5/8-inch oil and wax on canvas by Brice Marden that was executed in 1970 and has an ambitious estimate of $2,000,000 to $3,000,000. It sold for $1,875,750, breaking the previous world auction record for the artist of $1,545,750. The three-panel work is dedicated to Janis Joplin, the singer who was a native of Port Arthur, Texas, as was Robert Rauschenberg for whom Marden worked as an assistant in 1966. "For Pearl stands as a monument to the simple purity of the monochromatic panels of the early 1970s, which was soon t be followed by a growing complexity in Mardens aesthetic," the catalogue observed. Lot 35, "Disappearance I," is a 40-inch square encaustic and canvas collage on canvas, dated 1960, by Jasper Johns. The gray and white work has an ambitious estimate of $4,000,000 to $6,000,000 and its title refers to the fact that the canvas is doubled over the back to make the painting more of an object. It passed at $3,400,000. 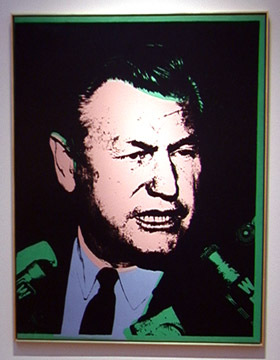 Lot 45, "Portrait of Nelson A. Rockefeller # 3," is one panel of a four-section work by Andy Warhol depicting the former Governor of New York and scion of one of the countrys wealthiest families and one of the nations foremost art collectors. It is one of the best of Warhols famous portraits and catches the intensity and focus of its subject, shown at a press conference, very well. The 75-by-65-inch synthetic polymer and silkscreen ink on canvas was painted in 1967 and has a modest estimate of $400,000 to $600,000. It sold for $401,750. 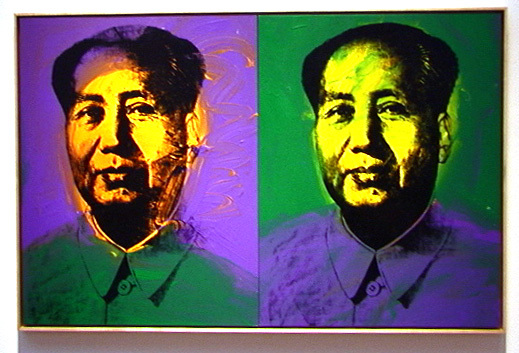 Another fine Warhol is Lot 48, "Mao," a 36-by-56-inch synthetic polymer and silkscreen ink on canvas that was painted in 1972-4. The double portrait is very colorful and strong and has an estimate of $800,000 to $1,200,000. It sold for $687,750. 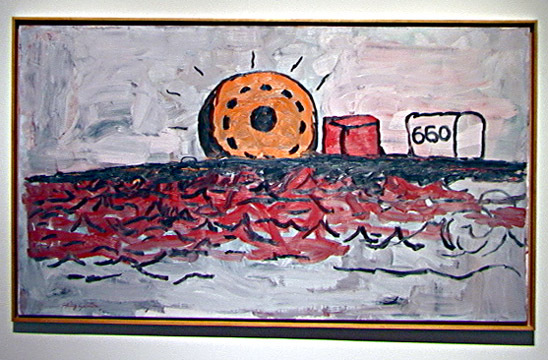 Lot 50, "Maverick Sun" is a very good Philip Guston oil on canvas, 50 ½ by 91 inches that was painted in 1972 and has an estimate of $500,000 to $700,000. It sold for $489,750. Donald Judd has two excellent works in the auction, Lots 53 and 46. The former consists of six brushed aluminum hollow rectangles set at 14-inch intervals. Executed in 1978-9, this is one of the artists handsomest works and has an estimate of $550,000 to $750,000. It passed at $420,000. 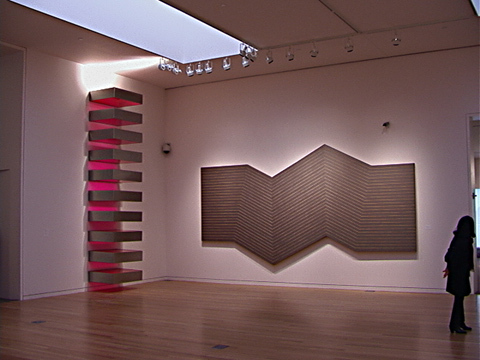 The latter is a more conventional Judd, a stack of 10 stainless steel and red fluorescent Plexiglass units stacked against a wall vertically with 9-inch intervals. It has an estimate of $200,000 to $300,000. It sold for $819,750, a world auction record for the artist. New auction records were also set for Cecily Brown, whose "Twenty Million Sweethearts," Lot 1, sold for $87,000; Gary Hume, whose "Pauline," Lot 2, sold for $159,750; Robert Gober, whose "Deep Basin Sink," Lot 5, sold for $830,750, and whose simple drawing for the sink, Lot 6, sold for $55,959, a record for a work on paper by the artist; Maurizio Cattelan, whose "Spermini," Lot 10, sold for $159,750; Felix Gonzalez-Torres, whose "Untitled (Lover Boys)," Lot 13, sold for $456,750; Cy Twombly's "Silex Scintillans," Lot 38, which sold for $885,750, a record for a work on paper by the artist; Alexander Calder, whose huge sculpture, "Stegosaurus," Lot 39, sold for $4,185,750; and Dan Flavin, whose "Alternate Diagonals of March 2, 1964," Lot 52, sold for $335,750. Two works by minor works by Jasper Johns failed to sell as did a small double portrait by Francis Bacon, a painting by Anselm Kiefer, a good Sam Francis, a complex Jean-Michel Basquiat and a nice mobile by Alexander Calder.